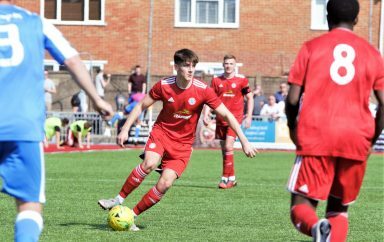 Victory at Meadowbank, coupled with a late equaliser for Hornchurch against nearest challengers, Haringey Borough saw the hosts claim The Bostik League Premier Division Championship, against a well-beaten Reds. For the first time this season, not even the subs bench saw any changes from last week, as Alex Parsons sat out the last of his four match ban and Danny Barker continued to recover from his hamstring injury. The game started at a frenetic pace; Tom Richards’ playing a neat 1-2 down the left with Niall McManus and his cross was scooped over the bar from close in by Elliott Buchanan, after only two minutes. 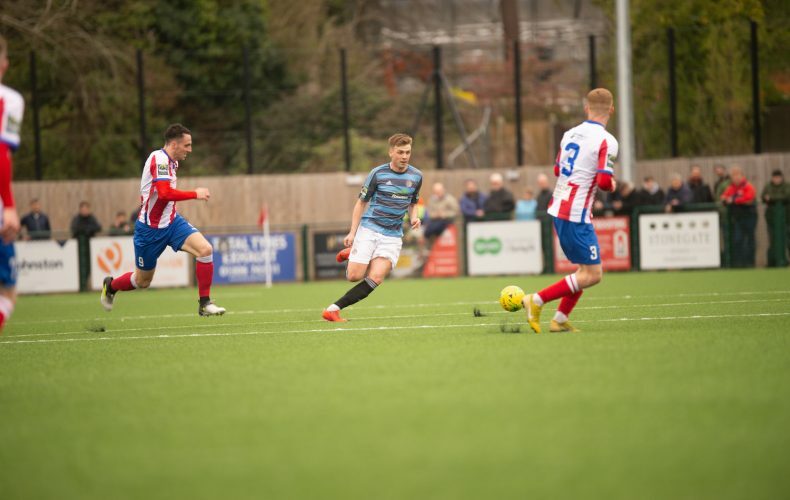 Sixty seconds later and a foul on Kwame by Luke Moore resulted in Ricky Aguiar’s low free-kick finding the safe hands of Player of the Month, Slav Huk. A long pass by Joel Colbran sought out David Ajiboye and, although he beat Tom Richards, he couldn’t do the same to Huk at the near post. However. possession was maintained by the visitors and Ajiboye’s next attempt lead to a delivery to the opposite upright that Ollie Pearce couldn’t quite connect with. Both sides continued to exchange efforts and Richards had a good one approaching the half-hour mark but dragged wide, before Huk denied Callum Kealy and Jason Prior curled past the top corner, as play switched from one end to the other. Ross Edwards beat Buchanan to the ball and Lewis Taylor fired over from long range as the title chasers looked to fashion a breakthrough. Colbran headed off the line but the assistant’s flag was up for offside and Prior pounced on a loose ball, only to pull his shot across goal and out for a goal-kick. 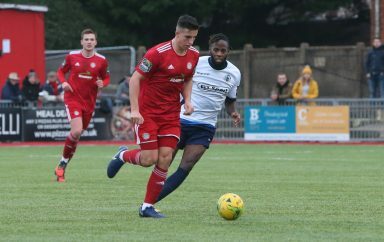 Sam Beard had to improvise, when Pearce’s ball in from the left forced the full-back into a diving header over his own crossbar, from the six yard line and shortly after that, Ajiboye was a whisker away when Prior’s weak headed clearance fell invitingly for him, twenty yards out. Some neat approach work ended with James McShane hooking a decent opening the wrong side of the far post but the first goal of the afternoon wasn’t long in coming. Richards spotted Taylor at the back stick and he couldn’t keep his header down but that was due, in part at least, to Jalen Jones giving him a push, that the eagle-eyed referee punished instantly with the awarding of a penalty. Prior made no mistake, powering into the top corner from twelve yards to give Lucas Covolan no chance. The former Bognor favourite nearly made it two five minutes later, only to place an unmarked header wide of the target, after Jesse Starkey had put Richard’s initial fizzer, out for a flag-kick. Buchanan had one final chance just shy of half-time, when he drove towards the byline and flashed an effort across the face of goal but the score stayed at 1-0. Some people were still stirring their tea when McManus presented McShane with an opportunity that hit the bar and Richards couldn’t keep his shot down, as the ball was laid back to him. 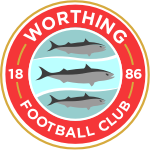 Two goals in three minutes then sealed Worthing’s fate and left the Chicks with one hand on the trophy. Firstly, McManus’ right-sided delivery was lifted over Lucas by Sponsor’s Man of The Match, Moore and Prior flicked on a long throw to allow the other centre-half, Taylor to poach a match-winning third. In between times, Colbran’s chipped cross had gone straight into the hands of Huk, as little was seen of The Reds in an attacking sense, after the break. Covolan held onto Richard’s low ball into the near post, after the winger had given Colbran a torrid time on the left, before setting-up Buchanan to offer the ‘keeper some more glovework. for identical twin, Danny, in a rare light-hearted episode for an outplayed travelling contingent. With the end fast approaching, Kwame located Kealy, who failed to test Huk, while a good build-up by the Champions-elect saw Moore spread the play out to McManus on the right flank, only for him to slip at the vital moment and put his attempted cross behind. Taylor earned himself a booking for bringing down Kealy on the edge of the box – as the visitors tried to salvage something from the game – but Starkey fired the set-piece into the wall. Finally, in stoppage time, two substitute’s combined in an attempt to add further gloss to the outcome, when Reece Hall had time to pick his spot, where he was kept out by Covolan and Jerry O’Sullivan dinked behind, trying to keep the move alive. Prior tried one last time to add the cherry on top, by endeavouring to sneak the ball past Lucas at his near upright but our buoyant Brazilian was having none of it.